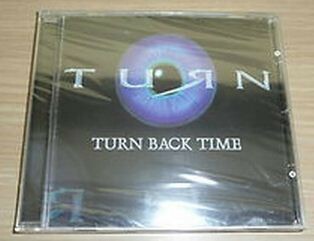 Home / Search by Media Type / CD / TURN: Turn back time CD a la Journey, Bad English. RARE. TURN: Turn back time CD a la Journey, Bad English. RARE. This German melodic rock band hails from Kircheim and this, their debut mini-CD counts 5 tracks. The production is very impressive and just couldn’t be better. Unlike many other German bands, TURN has a very good melodic singer Steffen Lauth, who definitely is as good as American or English singers. A mix of uptempo rockers and some ballads in the same style as BAD ENGLISH, STREET TALK, ROKBOX and a little JOURNEY and ALIEN thrown in for good measure. Very Good AOR/Melodic Rock indeed. There are more uptempo songs than midtempo or ballads. The Semi-Ballad “Honestly”, the Excellent Midtempo “Dream Dancer” and “Crazy Mama” are my favorite tracks. Very pleasant E.P. TURN was formed at the end of the nineties by bass player Pee Bonfert together with long-term friends Martin Kalus (vocals) and Drummer Axek Winkler around around Stuttgart, South Germany. With guitarist Jacek Jan Zajac and keyboard player Markus Metzger (later in SUBWAY) aboard, started independently in 2000 the recording of their début album. The sessions were delayed by the vocalist illness, which was replaced by young singer Steffen Lauth. The band recorded 9 tracks, but decided to release a (self-financed)5-track CD; “Turn Back Time”. TURN plays a truly enjoyable Melodic Rock / AOR here, influenced by classic major acts but with some modern touches. 1. “Change The Letters” opens with an acoustic intro that soon turns into a catchy uptempo melodic rocker with layered keyboards and very good backing vocals. The additional drums adds a cool modern (yet not annoying) feel to the song. Swedes’ T’Bell come to mind here. 2. “Crazy Mama” is driven by more strong guitars and a fine electric piano line that reminds you Jonathan Cain / Journey. But the overall song-style recalls ’90s Alien or Hugo/Valentine. 3. The third song is musically the most complete in the CD. Its a smooth very European midtempo MR / AOR tune in the Street Talk vein, with really good instrumentation and harmony vocals. 4. Next we have the melodious ballad “Honesty”, filled with dreamy keyboards. Nice one. 5. Closing track “Living in Darkness” is another good modern midtempo melodic rocker, again with clever programming in the background and an ’80s feel in the chorus. “Turn Back Time” is one of the best indies of the beginning of the new millennium, combining the ear-candy sound of ’80s Melodic Rock / AOR with modern programming which gives to the music an original twist. Not in vain Dan Huff (Giant) was interested to produce the guys, but when he was available in his busy schedule, the original singer got sick. A pity. Anyway, TURN managed to obtain a remarkable sound out of these songs, produced and arranged by keyboard player Markus Metzger with the help of Bonfert. Good Stuff, rare and Out Of Print.